It seems only fair to warn you about the dangers of Sweet Jules caramels. Your generous nature and inclination to share might vanish soon after you’ve bitten into one. You may find yourself wanting to hoard these rich, buttery treats and savor each silky, melt-in-your-mouth bite in solitude. You can blame Hope Klocker and Jules Vranian, two sisters born into a family of culinary pros and restaurateurs, for bringing out your selfish side. If they hadn’t insisted on using only natural ingredients, sourced from around the world, maybe you’d be more inclined to share. But blending caramel with dark chocolate and Fleur de Sel salt is just asking for solitary enjoyment. Classic vanilla bean, glorious Sicilian orange, and decadent bananas foster are equally tempting. And their caramels infused with the taste of craft beer and salty pretzels? Sure, the flavor screams party but we still didn’t want to part with them. So don’t worry if you’re less than generous with your Sweet Jules caramels. We won’t judge you. We know the feeling. Hello Daily Grommet fans. 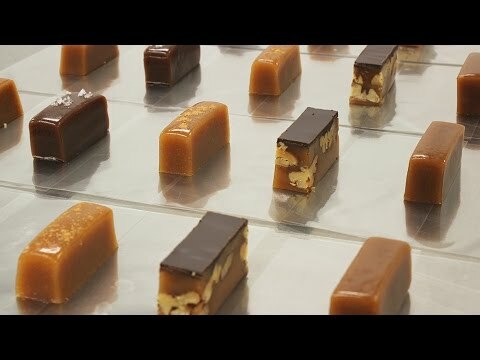 We started our caramel business because we are passionate about truly great candy and wanted to be part of the American chef's movement to bring back authentic foods. 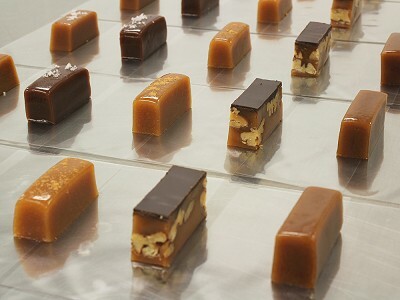 Sweet Jules caramels are fresh morsels full of wonderfully sweet and unique flavors. We'd be happy to answer any questions you may have. I have been thoroughly enjoying And sharing these fabulous caramels for more than a year now. I really can't pick which flavor I enjoy the most, so I always get the variety box. HEAVEN! So glad you like them. We aim to please. These are the best caramels that I have ever had!!!! My favorite are the Fleur de Sel caramels they are amazing! I have purchased these caramels for Mother's Day presents and gotten rave reviews for such a thoughtful gift! They are melt in your mouth delicious! 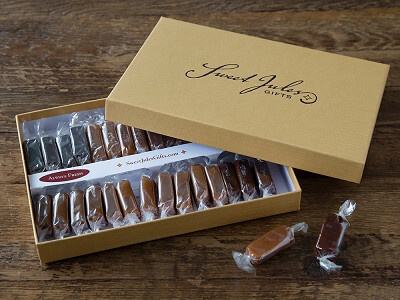 I suggest Sweet Jule's Caramels for all gift giving occassions! Yum, yum! The best caramels are from Sweet Jules! We know that all the guests will enjoy them. These are the BEST caramels EVER!!! I, along with the Lincoln Insurance Services family, love, love, love them!!! We are so proud and excited to see you on here. Hey, thanks Mayumi. Our best to everyone at Lincoln. Looks YUMMY. Can you let me know about how many are in each portion available? Trying to decide whether to get a pound or half pound. Thanks! There are 32 pieces in the pound box and 16 in the half pound. And there are eight flavors in all. So four of each for the pound box and two of each in the half-pound box. I am so proud of my dear friend. Jules and her sister Hope literally pour their heart and soul into these gems and has set the bar very high in the world of caramels. 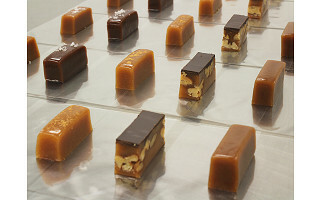 President Obama has to have just one and he will know then that these are top of the line and his search for the best caramels stops at Sweet Jules. 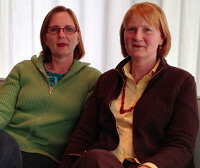 Fans of Sweet Jules Caramels - thank you so much for stopping by to share your first hand stories with these caramels. We're glad you're here. I buy Sweet Jules for my corporate gifts and one of my clients told me she actually cried when the box was empty! They are the best client gifts I have ever given & continue to give. Thanks Sweet Jules for making me look good! Thank you to all the talent at the Daily Grommet. Today has been an exciting day for us. @ Jule - You are very welcome! It has been our pleasure to introduce your mouthwatering confections to our community. Sooooo incredibly delicious!!!!!! Purchased several gift bags for my husbands business meeting and should have given them out after the dinner - once they started sampling them they couldn't stop!!! They must have been made by angels because they tasted so heavenly! I LOVE Sweet Jules caramels!! So good, so buttery sweet, an explosion of flavor in your mouth every time. I love how accommodating they are with last minute orders and how every box you open gives you that little chill of wonderful expection of whats to come. BRAVO!!!! I ordered a half pound of the "beer and pretzel" flavor and a half pound of the "fleur de sel" caramels. They are the best tasting and creamiest caramels I have ever tasted!!!! And the presentation you ladies have come up with is just so pretty. The box they come in, the pretty little bow on the box, and the red tissue paper wrapping is lovely! We're so pleased that you like our caramels. Thank you for your kind words. We really do appreciate your business.